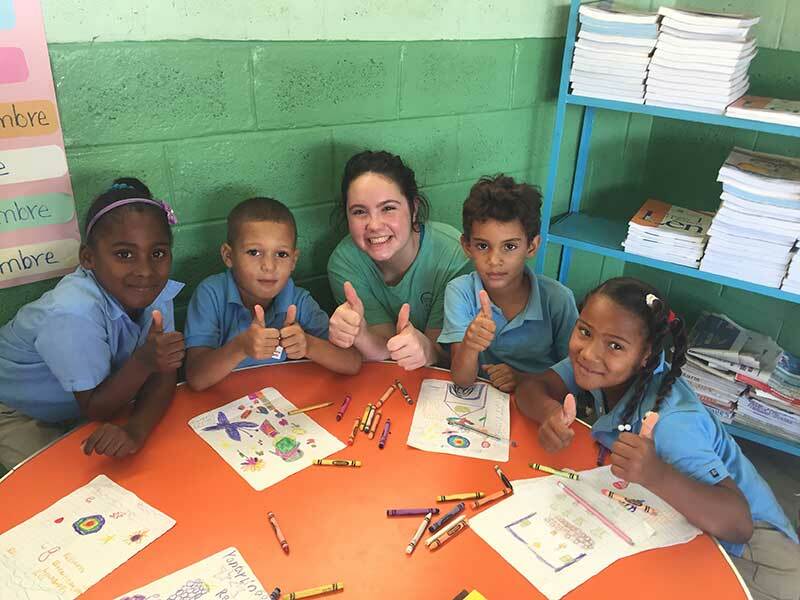 St. Mary’s Dominican High School Junior Jeanne Lassere (Belle Chasse) with students in the classroom at Espíritu Santo School in the Dominican Republic. They may seem to have nothing, yet they have everything. This became noticeable to me after encountering the people of Bani. 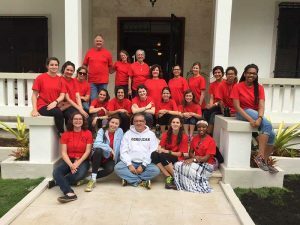 During the mid February Mardi Gras break, 22 members of St. Mary’s Dominican High School – students, alumnae, faculty, and parents, embarked on a journey to Bani, in the Dominican Republic. There, my perspective on life changed drastically. The trivial and miniscule items of my life suddenly became unimportant as I witnessed what little material wants the people of Bani actually had. However, they were rich in faith, study, and community. These are three of the four pillars of our school’s foundation. The fourth – ministry, was our mission. During recess, students in the pre-K classes show off their stickers for a photo with their new friend Jeanne Lassere. We were in Bani to help the preschool to high school students of Espíritu Santo School. They immediately cherished our presence, as we did theirs, and bonds quickly formed. We were able to share our contrasting cultures and also our surprisingly similar teenage interests, such as favorite songs. We bonded with the grammar school children through sports. In the preschool, we sang, danced, and led crafts with children. We also introduced students to English by matching English words to corresponding Spanish words. The students’ enthusiasm towards learning showed their appreciation for education. Their passion gave me a new appreciation for my own education. We also visited the neighborhoods of Bani and the sick. These outings truly touched me, as I understood more deeply suffering with Christ. They embraced each other and us with open arms. Community was apparent through small things like friends dancing the Bachata at school or neighborhood residents playing nightly after dinner. They value friendship, which can often be overlooked because of the material things in life. 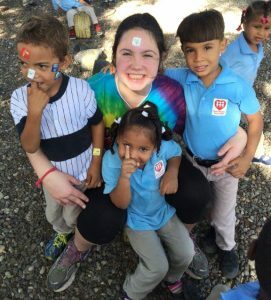 This mission trip helped strengthen my relationship with God, others, and myself. I quickly learned that giving up my Mardi Gras break was worth the feeling of authentic happiness and appreciation I have gained. This is just my first step of serving others, and therefore God. The people of Bani impacted me more than I could have ever dreamed of impacting them. On the steps of Convento Santa Catalina in the Dominican Republic’s capital of Santo Domingo, members of St. Mary’s Dominican High School’s mission trip gather for a group photo. Front row, from left: Anabelle Johnson, Emma Loetzerich, Fr. John Restrepo, O.P., (DHS Chaplain and Pastor of St. Anthony Padua Church), Madeline Puente and Turquoise Webber. Second row: DHS teacher Lauren Coumes, Jeanne Lassere, Nicole Delesdernier (DHS alumna ’12), Emily Doyle, Caroline Jacobi, Madison French, Anna Mermilliod, and Jennifer Baker. Third row: Parent Don Doerries, Katherine Frazier (candidate with the Adrian Dominican Sisters), Sr. Pat Harvat, O.P., (DHS Vice President of Dominican Catholic Identity), Jamie Lassere (DHS Vice President of Advancement, parent/DHS ’87), Michelle Gobert (parent/DHS ’85), Melissa Doyle (parent), Logan Gobert, Victoria Gillam, and Elyse Harrison (DHS ’13).